You know those “weigh stations” they have along major highways? I don’t know how many hundreds of them I’ve passed in my lifetime, but every single one of them has been closed when I passed by. Every one. Doesn’t matter what time of day or night I pass them. For years I wondered why they even exist if they’re never open. Then, in South Dakota a couple of weeks ago, we passed one that was open. Since then we’ve seen a bunch more that were closed but two others that were open. I still have no idea why they exist, though. The worst motels have the best pillows. Not best in terms of quality, but best in terms of being comfortable to sleep on. There’s a big pizzeria chain in the Midwest called Pizza Ranch. We’ve driven past dozens of them. I’ve never eaten at a Pizza Ranch, and I have no knowledge of the quality of the pizza there. But I do know that ranches in general are not known for their pizza. You have to wonder why anyone would name their restaurant by combining the type of food served and the very last place in the country you’d ever expect to find that food. A bunch of plastic grocery bags for use as in-car garbage bags might be the smartest thing I packed. Baby wipes is probably #2. When you look at a map of the country it’s hard to understand why many of the state borders are where they are. Some run along rivers, which makes sense. Some are just straight lines, which makes a different kind of sense. The rest seem pretty arbitrary. But when you actually go there, just looking around makes you think they got it right. It’s amazing how drastically the natural scenery changes almost as soon as you cross any state line. 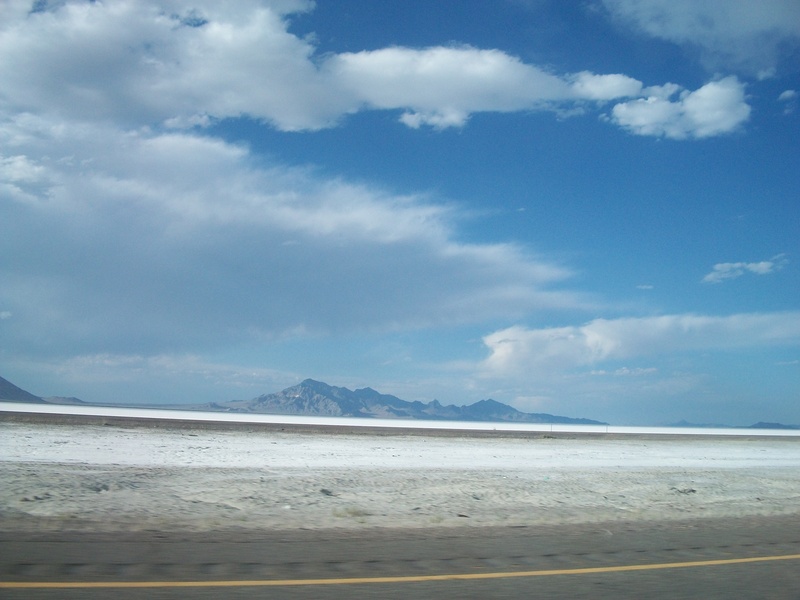 Farms give way to mountains, mountains give way to cities, cities give way to cattle ranches, cattle ranches give way to forests, forests give way to deserts, and I don’t even know how to describe the white, snowy-looking salt flats of Utah. National Parks have lousy gift shops. Everywhere in the country, you don’t have to drive more than two or three exits on the highway to find a cheap motel. And the further you get from the cities, the easier to find and cheaper they are. Everywhere, that is, except for Montana, Nevada, and Wyoming, where you have to be pretty close to a city of some kind to have any hope of finding a place to stay, because in between the cities there is nothing. We’ve seen countless deer crossing signs, and we’ve also seen cow crossing signs, man-on-horseback crossing signs, elk crossing signs, bear crossing signs, and even a couple of bull crossing signs. We have seen no actual animals crossing the highway. Mets fans are everywhere. Just wear a Mets shirt and they will find you. Sam is fascinated by the ramps for runaway trucks on long downhill stretches of road. He originally thought that “Runaway Truck Ramp” meant that a truck ramp was on the loose. As we entered California from the north we had to stop at an agricultural checkpoint to make sure we weren’t bringing in anything dangerous like, say, a banana. Seriously, California? You’re pretty much constantly battling wildfires, mudslides, earthquakes, heat waves, illegal immigration, race riots, and bankrupcy, and you’re worried that the lunch I packed might mess up your state? By the way, as we entered California from the west there was no such checkpoint. I guess the danger is confined to Oregonian produce. It sure is easy to figure out which states allow the sale of fireworks and which don’t. We’ve passed several flatbed trucks with “oversize load” signs. A couple were carrying enormous tires for tractors or monster trucks or whatever. One was carrying way too much lumber. The rest were carrying houses. We wondered what happens when you call the house-delivery company to place an order and they ask for your address. In the really remote parts of the country, some of the exits on the Interstate have blue signs beneath them that say “no services.” This means that there is not a single gas station, bathroom, ATM, or McDonalds anywhere near here. Being from New York, I find that astounding. If there’s literally nothing there, then why is there an exit? One of our great pleasures on the road is passing a car that’s even more overpacked than ours. My favorite part of every day is when we’re in the car and Sam, for no reason at all, reaches over and tenderly pats me on the shoulder. My least favorite part of every day is visiting the gift shop. Nevada and Utah are the only places in this country where nobody’s growing corn. Before this trip, the last time I saw a latrine was at sleepaway camp. Suddenly they’re everywhere we go. It’s one thing to see them inside a National Park campground. It’s quite another to see them at a rest stop on an Interstate highway. “Breakfast” means drastically different things at different motels.